Industry Nine front, pewter hub and spokes with Stans Podium rim QR. American Classic rear laced to Stans Podium rim 10mm thru axle. Both tubeless ready. Straight and smooth with no dings or flat spots. Super light @ 1350 grams for the set. Shimano disc hubs laced to Sun Rhyno Lite rims. Spin straight and smooth. 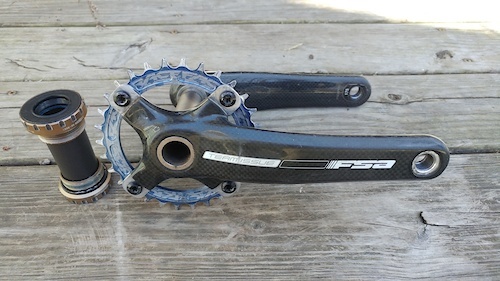 160 rotors, Stans Raven tires, SRAM 11/34 9-speed cassette and skewers included. Can't tear these up. 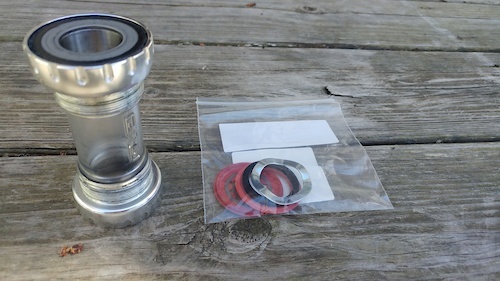 For threaded 68/73 spacing, bearings are great, new seal kit included. 1 1/8" straight steerer 7 1/4 " long, std. QR drops 120mm travel. Fork is in excellent condition, stanchions are perfect, no oil or air leaks, rebound works as it should. 1 1/8" straight steerer 7 1/4 " long, std. QR drops. Fork is in excellent condition, stanchions are perfect, no air or oil leaks rebound adjustment works as it should. Gettin hard to find these in this gooda shape.